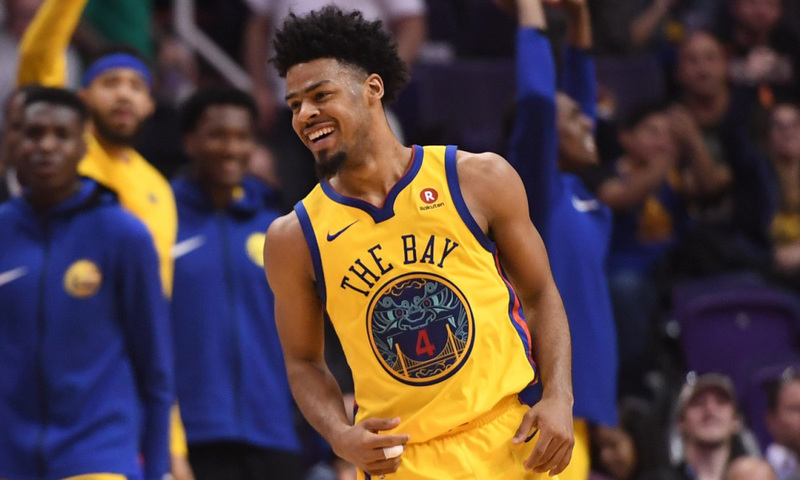 Quinn Cook’s life changed in eight days. Four days before he scored his first bucket in a Golden State Warriors jersey on October 21, his name was making headlines. As part of the NBA’s new two-way contract system, Cook joined the Warriors, alongside fellow two-way-er Chris Boucher. Four days before his signing with the Warriors however, Cook was waived by the Atlanta Hawks. For the Hawks, Cook was to fill the third-string point guard role, ideally as someone worth development as General Manager Travis Schlenk foretold. Maybe Cook’s ceiling was too high. Atlanta was in full tank mode the moment Paul Millsap and company walked, and Cook, who had seen time with competitive, anti-tank teams wasn’t the right lackey. The 25-year-old had impressed in the preceding summer league for the New Orleans Pelicans. His rippling six-foot-two frame is accompanied by a penchant for low, winding dribbles and a fluid jumper. So, when the Warriors came calling, it was a no brainer. Cook was already a winner. In his senior season with Duke, Quinn sealed the NCAA title with future NBA compatriots Justise Winslow, Tyus Jones, Marshall Plumlee and Jahlil Okafor. A four-year athlete and two time professional with the Dallas Mavericks and New Orleans Pelicans however, Cook’s body justified the signing. He was physically in a place that put one-and-done rookies to shame. Or maybe, for the superstitious, Cook’s signing was fate. In high school he suited up for the Oak Hill Academy. Their mascot? The Warriors. The contract didn’t bear fruit at first. After his initial game on October 21, Cook spent much of 2017 with the Santa Cruz Warriors. On Golden State’s G-League affiliate Cook torched the competition, posting 36 minutes per game and splits of 52.7, 43.9 and 94.9 percent. Those numbers look familiar. 50-40-90 club anyone? For a team boasting two members of the elusive 50-40-90 entourage in Kevin Durant and Steph Curry – three if you include Steve Kerr’s 50-50-90 1995-96 season in which he was 50 or so shots shy) – Cook’s presence was divine intervention. When Curry sprained his right ankle in December 2017, Cook was the man for the job. Joining the team on December 6 for a game at the Charlotte Hornets, Cook was thrust into the starting lineup. Setting off his 22 minutes played, Cook’s first shot attempt was a crumpled layup attempt completely erased by Dwight Howard. Instead of flopping or removing himself from the play, Cook played for his contract. He tracked down the rejected leather and shoveled it out to Klay Thompson in the corner. Thompson missed, and the play was swallowed up by the teal and purple tinted ether, but Cook’s tenacity was noted. Two more misses followed, including a 29-foot triple that slammed off the rim like a broken car door. But Cook kept shooting, and made his next three shots, ending the night with eight points, three assists and three rebounds. The subsequent chunk of six games saw Cook take part in each, but Curry’s return at the end of the month stunted Cook’s appearances. Add that Curry’s return was accompanied by a five-game average of 35.2 points on 57 percent from the floor, and Cook was no longer necessary. Or injuries. First, Curry went down with a left ankle affliction. Soon followed Thompson, with a broken right thumb. March 8 marked the regular return of Cook to the rotation. He’d play some combo of 20 to 40 minutes from that date and to begin the month of April. The minutes weren’t empty either. From March 14 to April 5, Cook posted 17.5 points on… What do you know, 53.2, 49.2 and 87.5 percent splits. Of course, Cook’s two-way deal posed contractual problems. The 17th man on the roster, someone had to leave to make room for Cook and his potentially magical playoff run. Omri Casspi was the unfortunate victim. Nine months after signing with Golden State the nine-year forward was sent packing as the Warriors try to fill out their playoff roster. With Curry likely out for the first round of the playoffs, where does that leave Cook? Clearly the go-to guard, Cook can support the Warriors star studded cast. Whether because of the Warriors tight ship or Cook’s intuition, or both, he’s capable of finding Golden State’s myriad of shooters in the right spots. An undersized guard, Cook his hearty frame can take contact remarkably well, finishing plays through contact. And when that fails, there’s always his smooth-sailing jumper. The Warriors need a healthy Curry as much as any other team needs their starting point guard. Having Cook moving forward, even at the expense of Casspi a.k.a. the Israeli Swaggy P, is a fruitful investment. Whether for this year, or seasons to come, Cook performs in the image of Steve Kerr’s Warriors.